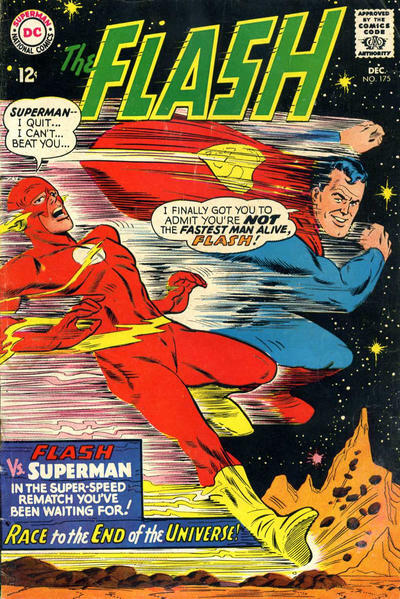 Actually, I think the more interesting question — a question for which one fan’s answer is as valid as any other’s, and can’t be overruled by the characters’ corporate owners — is, who should be faster, Superman or the Flash? As a nine-year-old in June, 1967, I had no doubt of my answer to that question. 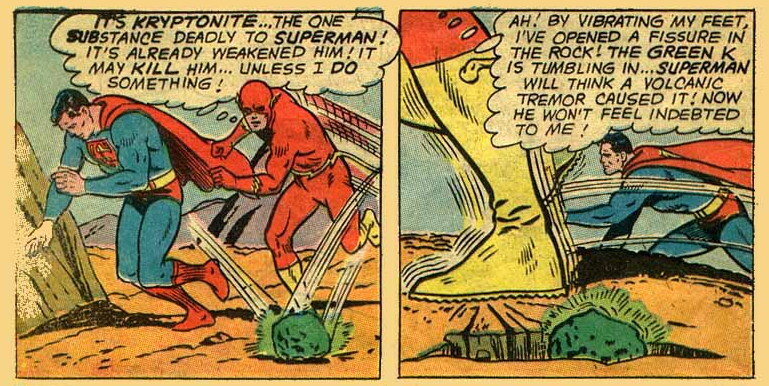 Superman was great, of course — he was the first superhero I’d ever encountered, after all, and after two years of buying and reading comic books he was still my single favorite Justice Leaguer, even if I didn’t pick up either of the books he headlined (Superman and Action Comics) very regularly — but the Flash was the Fastest Man Alive. I mean, they kept telling us that, in virtually every issue of the guy’s comic. 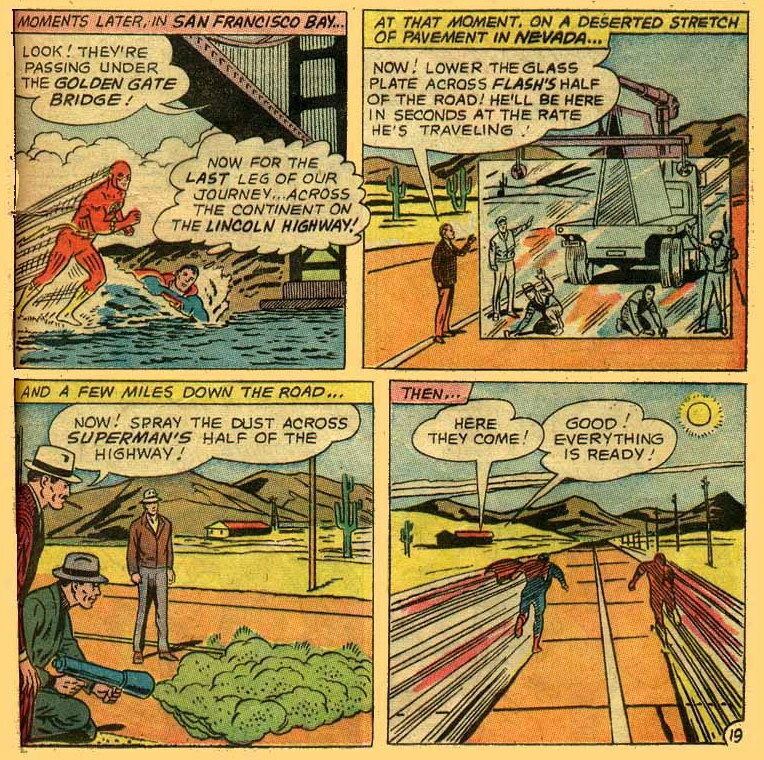 Either the Scarlet Speedster was faster than any other person on Earth, including the Man of Steel, or DC Comics had been lying to us for years. 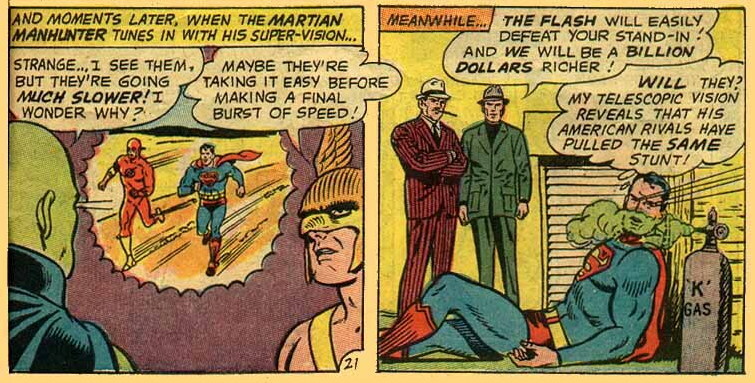 More to the point — speed was the Flash’s whole deal. Everything he could do, everything he was as a superhero, came down to speed. 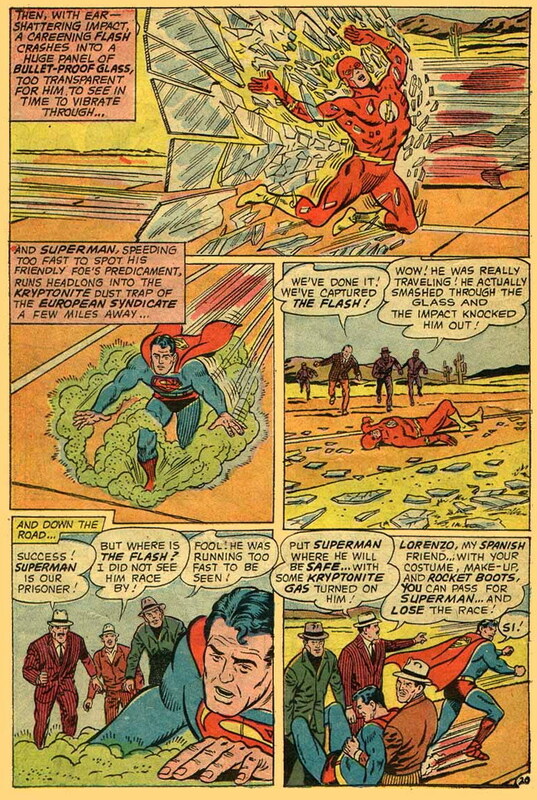 Superman, on the other hand, had all sorts of other things going on in addition to speed — strength, invulnerability, flight, heat vision, telescopic vision, x-ray vision, etc., etc. 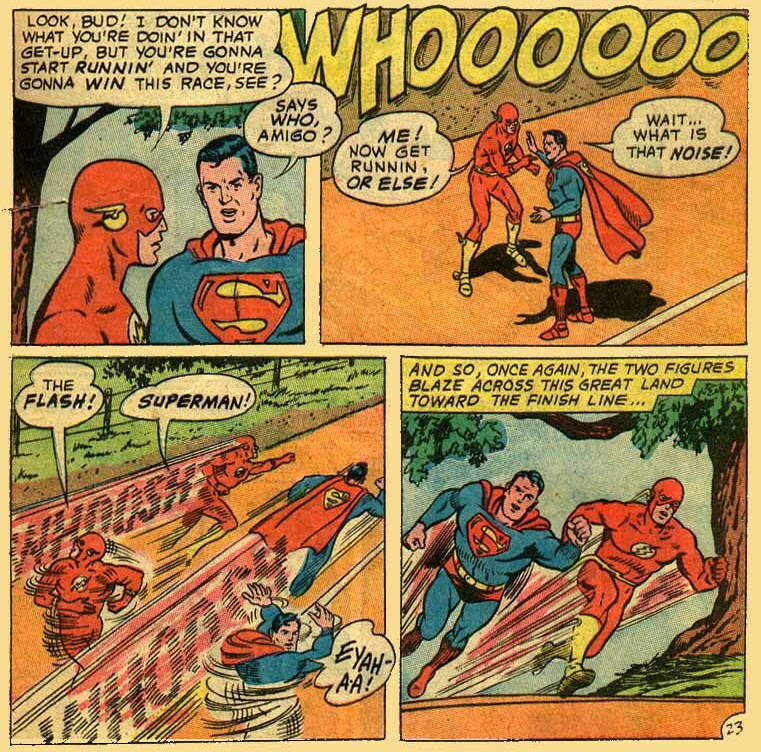 If Flash was a teensy-weensy bit faster than Superman, what difference did it make? Superman was still the most powerful superhero on Earth, obviously. 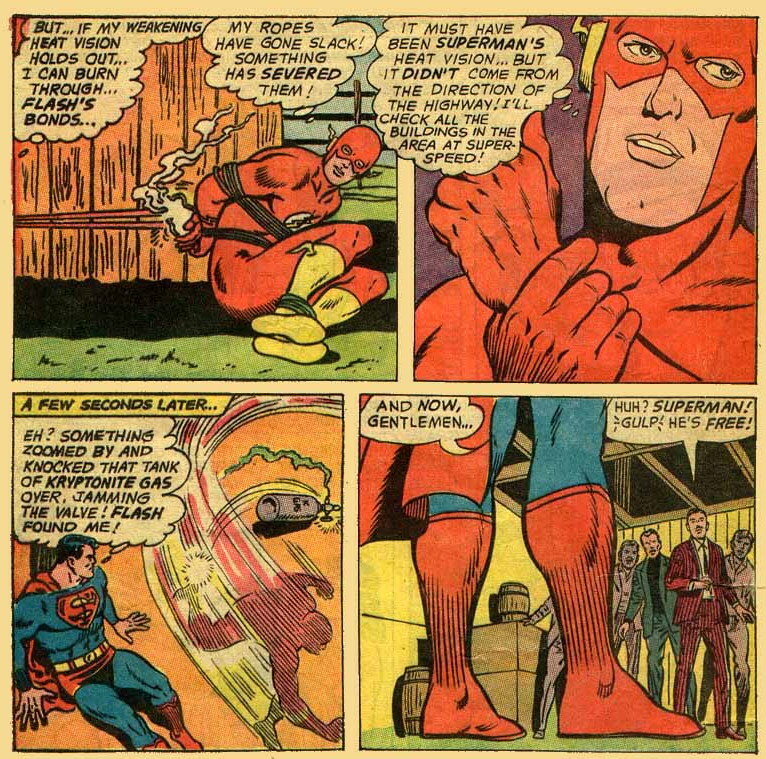 It was only fair, I thought, that when it came to this one thing that the Flash had that made him special — running really fast — he should be better at it than the Last Son of Krypton. I mean, why not? When I finally got the book home and was able to read it, I discovered that the interiors didn’t feature the art of Infantino, Flash’s regular artist, as had the cover. 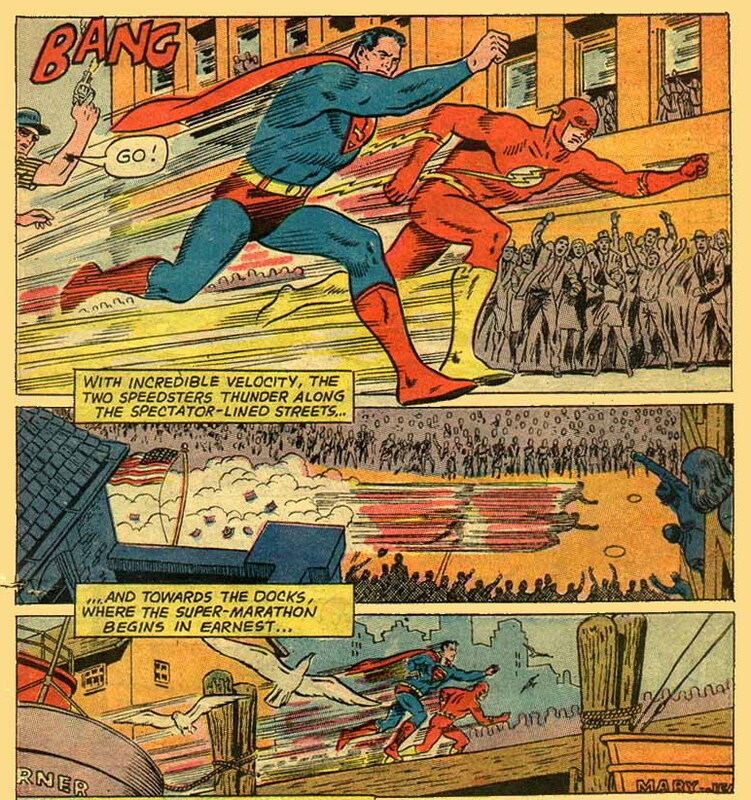 Rather, the interior art for “Superman’s Race with the Flash!” was pencilled by Curt Swan, Superman’s primary artist, with inks by George Klein. (The art was uncredited both on the cover and within the book, but my ten-year old self knew the difference between Infantino’s and Swan’s styles by sight.) Swan was my favorite Superman artist, and even if he didn’t bring the same dynamic sense of movement to a speeding figure that Infantino did, I could hardly be disappointed by the simple but elegant realism of his work. The script, meanwhile, was by Jim Shooter (also uncredited; but though I’d read Shooter’s writing elsewhere, I certainly wasn’t capable then of recognizing it by his style — in fact, I’m still not, so I’m grateful for the historical credits supplied by the Grand Comics Database and other sources) — who was only 15 years old at the time, though he’d already been writing scripts for Superman editor Mort Weisinger for a year. 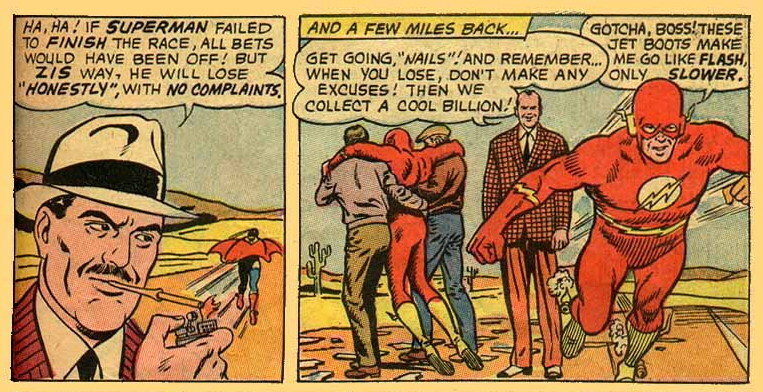 Obviously, busy, responsible heroes like Superman and the Flash can’t run a race just to, y’know, find out who’s fastest. They have to have A Good Reason. And raising “money for schools, hospitals, food and clothing for poverty-stricken lands” is a really good reason. But, of course, any sporting event this huge is going to attract gambling, whether legal or not. And, in fact, two different gambling syndicates, one in America and another in Europe, are betting against each other on the outcome of the race, to the tune of one billion dollars — and each, unknown to the other, is scheming to “fix” the race in their own favor. Now those are some role models, folks! Speeding across South America, the racing heroes complete their first circuit of the globe, and then return to the Atlantic for their second. This time, their route takes them through the African rain forests, then across the Indian Ocean, then through the Australian outback. But even as they race across the Pacific, heading for the third and final lap, the two competing criminal syndicates are closely monitoring their progress, preparing to spring their individual traps. Oh, no! And there’s no TV coverage way out there in the desert. But what about Green Lantern’s nifty power-ringed monitor? Unfortunately, it’s been temporarily knocked out of commission, as GL explains: “Apparently the heat of the Nevada desert formed a yellowish haze! 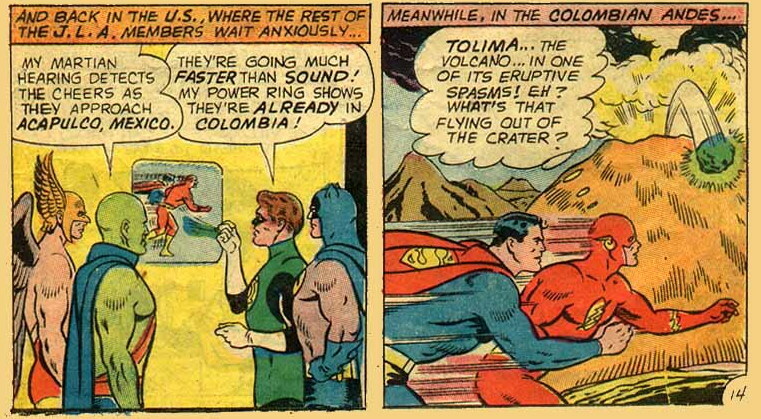 Anything yellow affects my power ring!” Gahh! A tie?!? What a rip-off!! Actually, if I recall correctly, my nine-year-old self — while disappointed that this story didn’t provide a definite resolution to the “Fastest Man Alive” question — wasn’t too terribly surprised at this outcome. 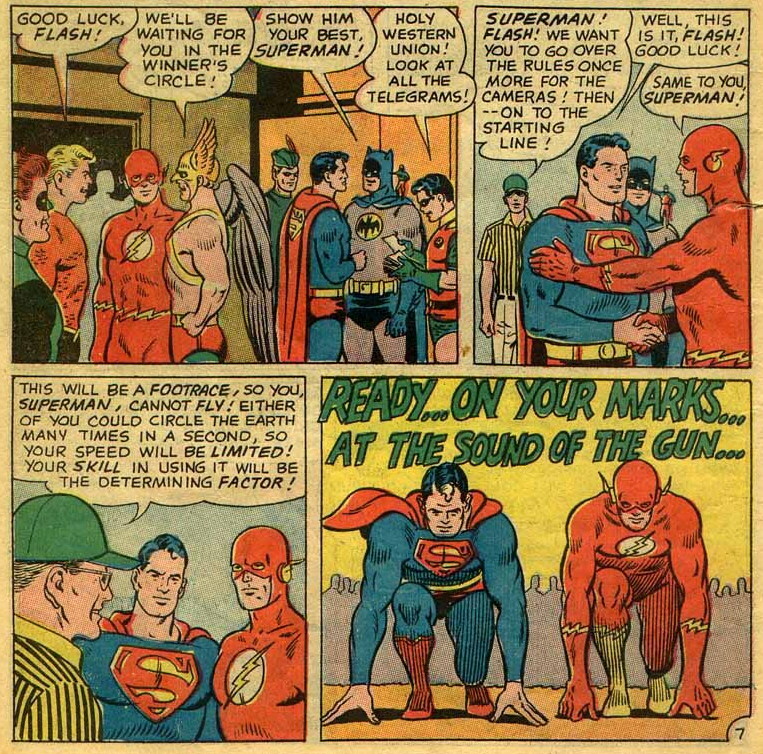 And, thanks to the final caption’s promise, I knew we were going to get a rematch “coming soon in The Flash!” Surely, in his own book, the Scarlet Speedster would finally be given his just deserts. Ah, what a naive young fan I was. 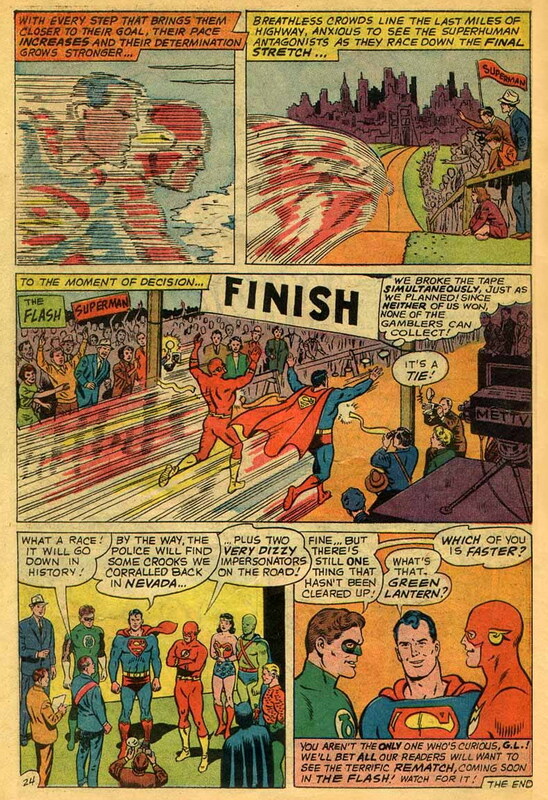 But to learn how that second race turned out, you’ll have to check back in about four months — when I’ll be blogging about “The Race to the End of the Universe!” in Flash #175. See you then! UPDATE: A few hours after this post went up, a bit of additional research turned up the fact that a fan raised an objection to Batman’s behavior on the cover in Superman #201’s letter column — and received the answer that it was, in fact, a mistake! Green Lantern? Well, sure. That makes perfect sense! I have spent the last 5 years collecting the race books from every published country. That’s interesting. I wouldn’t have expected him to have that much input into Mort Weisinger’s books at this point, however. Is this documented somewhere? Carmine’s auto-biography, The Amazing World of Carmine Infantino. Not only does it contain Carmine’s recollections but also those of many of his associates including Schwartz, Kubert, Orlando, Robert Kanigher, etc, etc. He was “Cover Editor.” No mater who did the final art, Infantino, Kubert, Adams, Cardy, Anderson, Irv Novick, Kaluta, etc, etc, most were based on concepts and layouts by Infantino. As Infantino continued up the corporate ladder, he continued to generate cover ideas and layouts. Thanks again for the comments! As I’ve already mentioned on Facebook, I’m a big fan of that book. I envy you having had the pleasure and privilege of working on it with Mr. Infantino. I remember when this book came out. 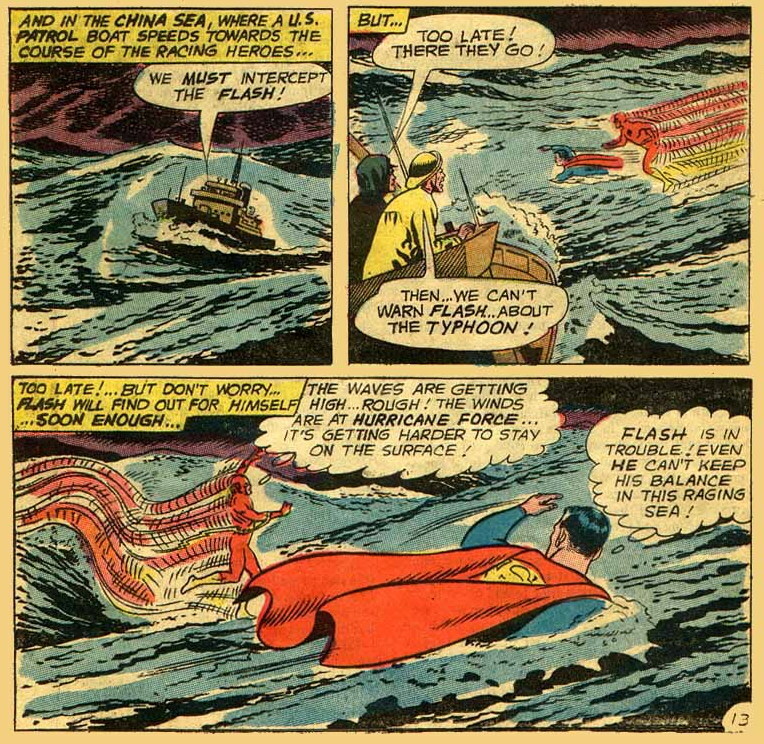 And I also remember thinking it was a moot point because I always felt that if Superman couldn’t vibrate through objects or run on top of the water like The Flash, then he couldn’t possibly be faster because if he were as fast or faster he ought to be able to do all the things Flash could. 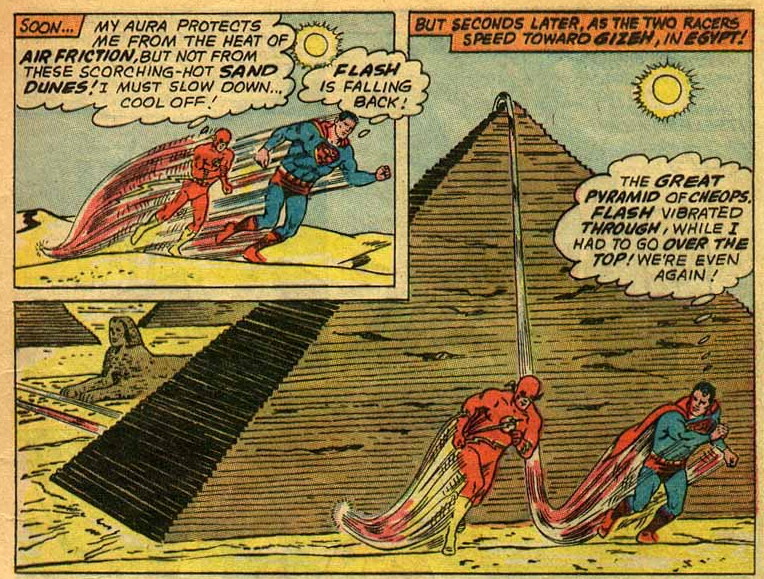 I’m sure they’ve managed to retcon the whole thing since then with some sort of Speed Force-related excuse, but it made sense to me at the time. 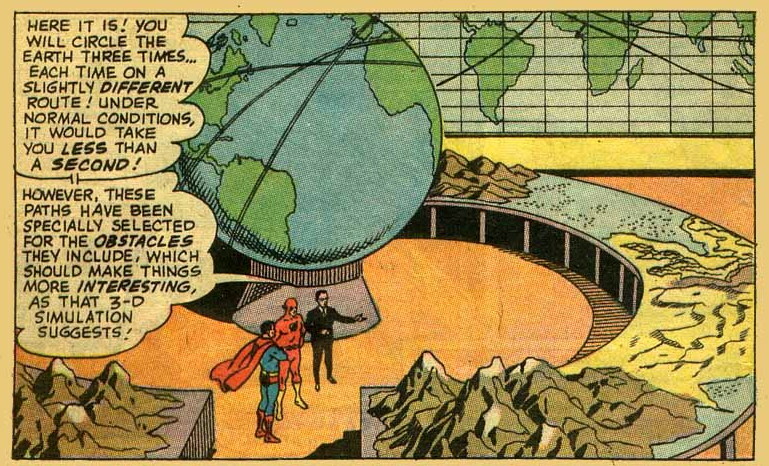 What a great novelty getting to see the JLA drawn by Curt Swan! I bet it’s the only time he ever did it. He’s a much better artist than Mike Sekowski but somehow I got used to Sekowski’s boxy style!